On more than one occasion I have felt certain that there was nothing more of interest for me in Stratford-Upon-Avon. I HAVE seen all the sights, every one of the Shakespeare properties, plays in all the theatres, the weekend markets, etc etc. But then I return and find that whether I've missed something interesting or not, I am charmed anew by this lovely Cotswold town. I first visited Stratford as part of my fortieth birthday present to myself, a trip to London from late December 1986 to early January 1987. I had been stationed in Germany in the 1960s, promised myself that I would return immediately and thereafter often to Europe, but has so often happens, life takes over and time flies by. I left Germany at the ripe old age of 22, and did not fly back across the great pond until nearly 20 years later. It was cold and damp when I landed in London in December '86, and remained cold and damp for my entire stay in the U.K. But I was so excited to see London, multicultural city, world capital, and one of the greatest theatre centers anywhere on earth, that no weather could dampen my spirits. I did all the major museums (National Gallery, Natl Portrait Gallery, The Tate - this was before the era of the Tate Modern, just the Tate thank you in Chelsea - the Courtauld, the British Museum, the Theatre Museum, still in existence back then), others. 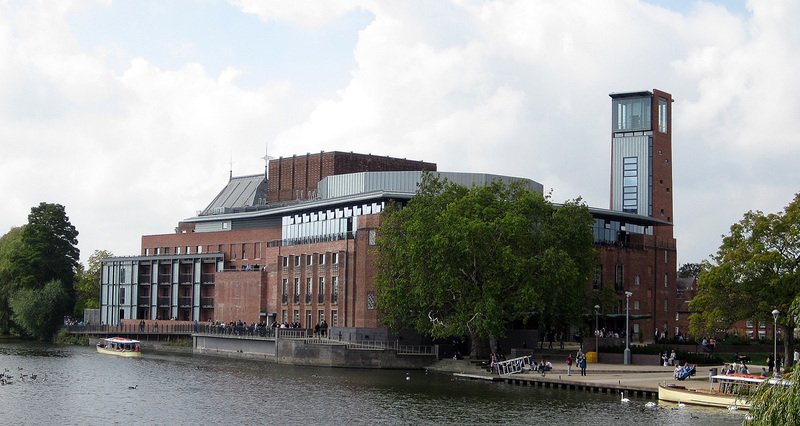 But I reserved New Year's Eve and New Year's day for Stratford-Upon-Avon, birthplace to the Bard, home to the RSC. I saw three plays in that very short period, Jeremy Irons in two of them, The Winter's Tale and Richard II, both in the large theatre; and Two Noble Kinsmen in the newly opened Swan Theatre. My memories of the productions are slim, Irons better as Richard than as Leontes, Imogen Stubbs wonderful as the Jailer's Daughter in Kinsmen. So wonderful that I attempted to chat her up in the Dirty Duck after, an attempt that failed miserably, I confess. I stayed in that B&B haven/heaven, Evesham Place, took in Shakespeare's birthplace, had roast beef and Yorkshire pudding on New Year's Eve. More even than London, Stratford was the best part of the best birthday present I could have given myself. I didn't get back to Stratford until fall 2005, though I had been to London several times since my 86-87 sojourn. I was teaching at the London Center that semester and one of the perks of the job is to be taken along on all official trips. I returned to Stratford on my own later in the semester, and spent several days there on a research trip in summer 2007, each time enjoying myself, each time thinking I'd probably not return, as I had seen all I wanted to see in Stratford-Upon-Avon. 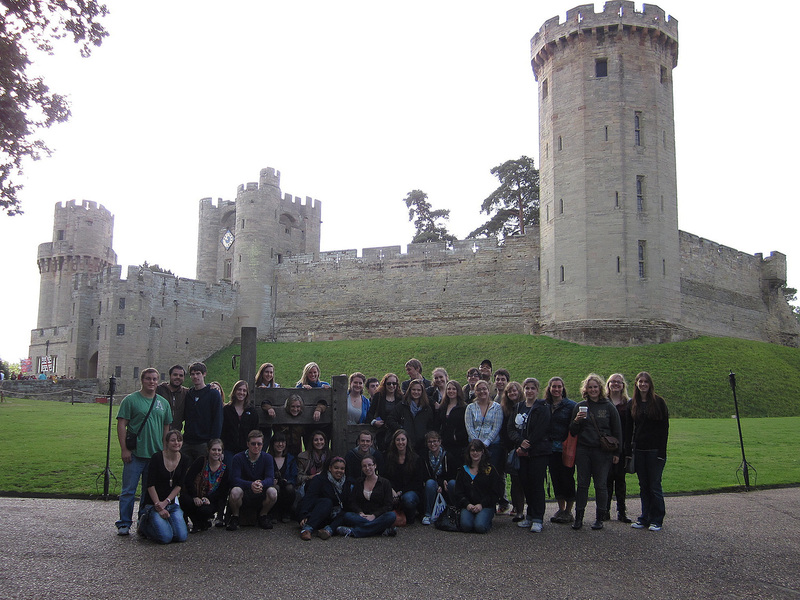 This was the case last weekend (23-24 September 2011), when Dottore Gianni took a trip with ICLC that included Warwick Castle, Stratford, and Oxford. These trips are designed to pack as much as possible into a one-overnight trip, and the London Center is very good at providing a full schedule of things to do and see during the short time frame. This trip mirrored the one I took in fall 2005, starting at Warwick Castle. It was my second visit and I did not change my opinion that is one of the most "theme-parked" castle I have seen. Madame Toussaud's mega-organization has peopled it with wax figures. As you walk through you'll occasionally come across a living human among the waxworks, whose job it is to explain what the room is all about. This is a clever bit, startling for an instant to see a figure rise and begin to chat, from what seem to be all wax, all the time! But once you've experienced it for the first time...well, let's just say that I see Warwick Castle as a one-joke show. There are other things to do. 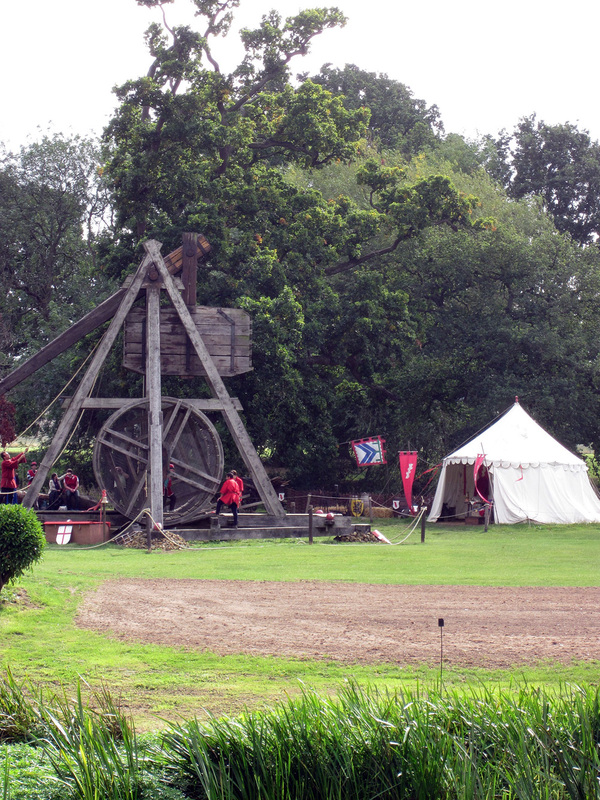 An archer shoots very well and talks to the tourists at the same time, a rock is launched from a trebuchet, that frightening medieval war machine, an expert handler of birds tells us about birds of prey and demonstrates as they fly just over our heads. But for myself, I prefer to walk through a ruined castle (Eilean Donan and Castle Conwy, just a bit earlier this trip, for example), than visit a glitzy one. 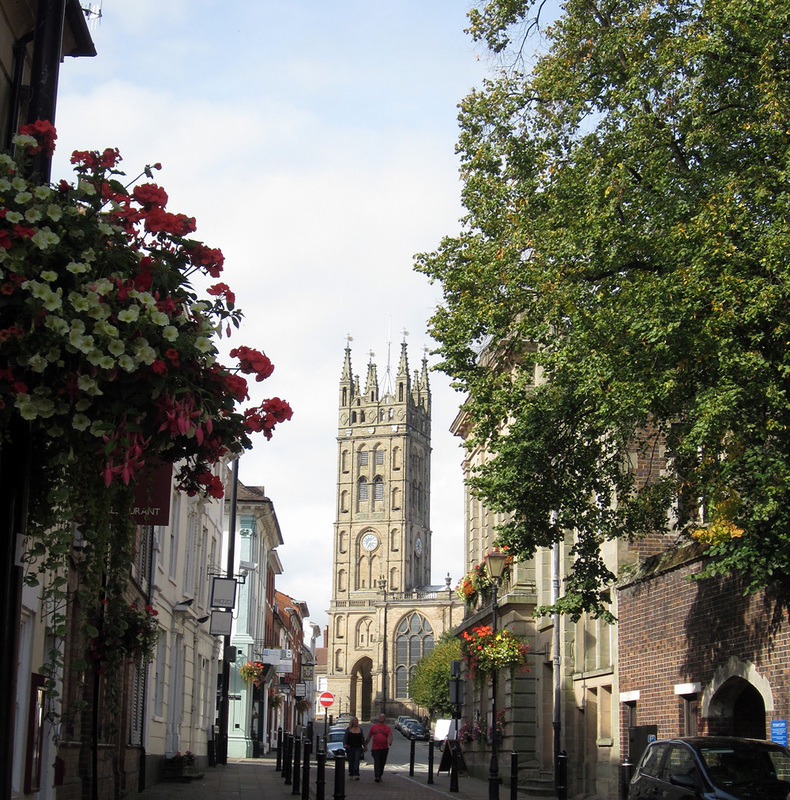 So this trip I ventured into the city of Warwick, a city quite lovely, easily worth an overnight visit, and every bit as interesting as the castle, especially its famous church, The Collegiate Church of St. Mary. This beauty is unassuming on the outside, but is a stunner on the inside. It features the remains of Richard de Beauchamp, Earl of Warwick, one of the men responsible for burning Joan of Arc, as well as the tomb of one of Queen Elizabeth's favorites, Robert Dudley, Earl of Leicester. These are located within the truly beautiful Chapel of Our Lady. Fascinating! Next stop was the main attraction, Stratford-Upon-Avon. We arrived in time to check into our B&Bs, get dinner (the faculty as usual at the Oppo, Tim Kidd pouring the wine, much merriment ensuing), and then to see A Midsummer Night's Dream in the recently completely transformed Royal Shakespeare Theatre. Once I got past the "concept" and I'm still not sure what it was, I very much enjoyed the production. It is hardly the finest I've seen, but it was well-spoken and performed, moved along quite nicely, highly physical in places, really quite enjoyable. I didn't take much of it with me, in fact the insubstantial pageant faded almost immediately as I entered the Dirty Duck and bought a pint, but I wasn't sorry I saw it. And it was a treat to see it in the new space, a deep thrust in what had once been a rather stodgy proscenium. After the pint at the Duck, Bill Sheasgreen and I hoofed it some distance to our B&B. While it is farther out than I've ever stayed in Stratford, Moss Cottage is a thoroughly pleasant place. The rooms were large, comfy and most important, en suite! And breakfast was one of the very finest I've tasted in such a setting. 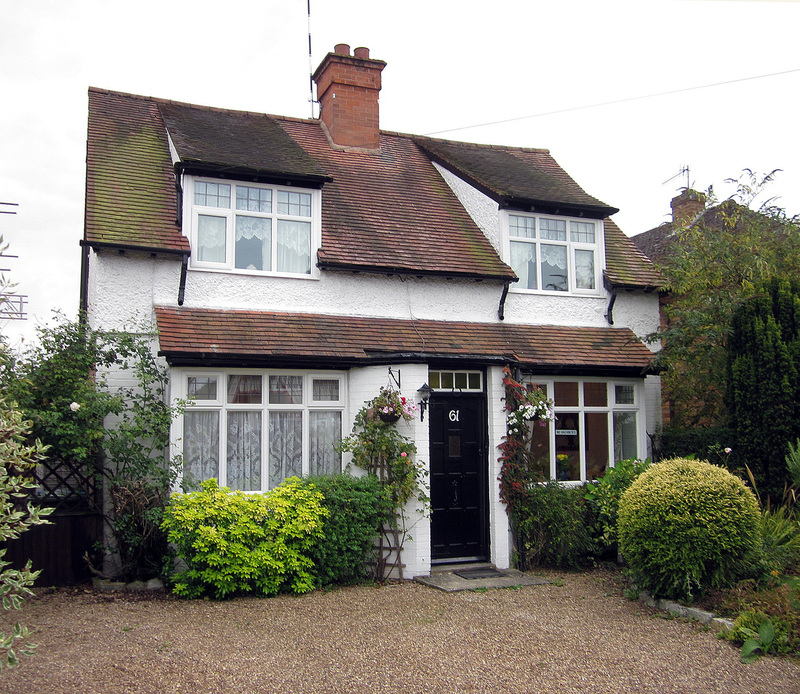 I'm considering returning to Stratford in about a month, and I'm definitely considering staying at Moss Cottage. Shakespeare's own words, apparently. And the carved bust of the bard, which in one critic's words, looks like " a self-satisfied pork butcher." 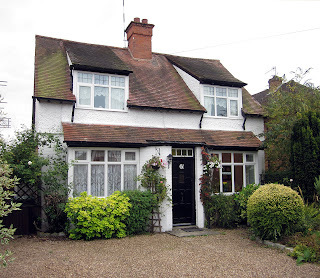 On then to three or four stops in Stratford, where Tim identified the properties (Hall's Croft, the school Shakespeare attended, New Place (now an archeological site as well as memorial), and talks at a spot opposite Town Hall and The Garrick pub. Then two hours to wander Stratford, grab a bite to eat (easier even than usual as there was a food festival going on in town) and buy souvenirs. Then off to Oxford, our last stop on this trip. 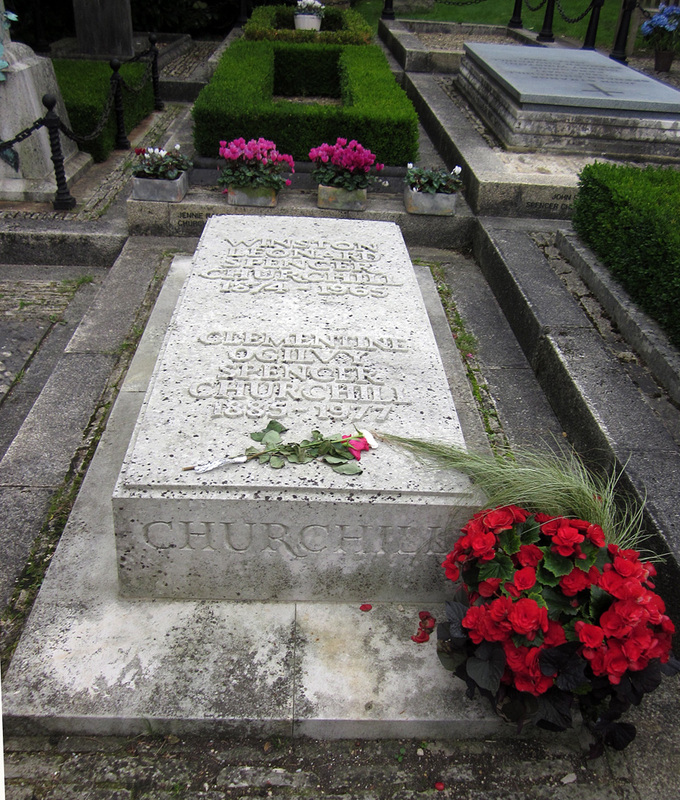 Bill surprised me a bit by taking a detour to see the grave of Winston Churchill. Unlike many men less famous than he, Churchill is not ensconced in Westminster Abbey, but in a graveyard of St Martin's Church in Bladon, a small Cotswold town, along with other members of his family, in a dignified plot. It made for a pleasant short break from the bus, and for a moment to pause and think on the second "world" war and Churchill's part in saving England against seeming insurmountable odds, a war shortly after which Dottore Gianni was born. I may not have conveyed it in my writing, but the weekend was a very busy one, hectic nearly, and for me at least, exhausting. I'm afraid my energy flagged when we arrived in Oxford, a town that I have visited only twice, once in the fall 2005 trip that mirrored the one from which I've just returned, and one for the better part of a week in summer 2007. I didn't enjoy it much the first time, for several reasons. On a Saturday afternoon the city center was packed as usual at that time of a weekend day, and, particularly having to fight the crowds, there wasn't nearly enough time to take in anything like all the sights. 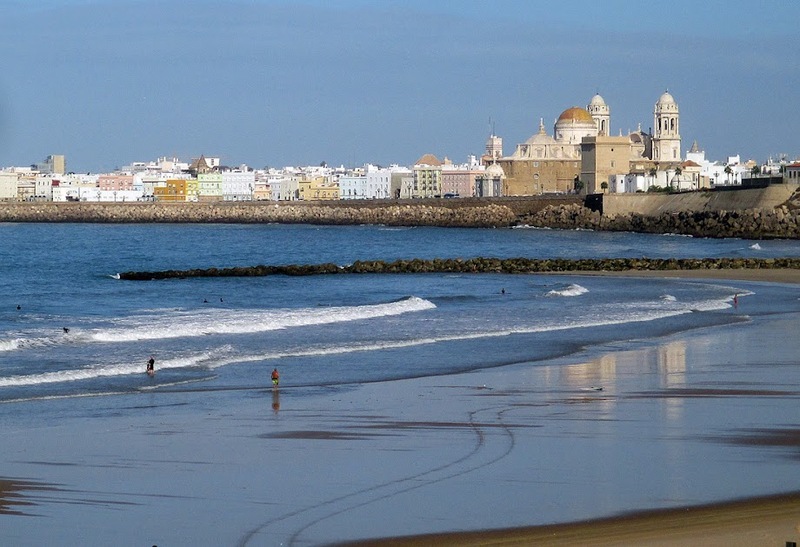 Also, for reasons too complicated and dull to delve into, on that trip in 2005 I was the only adult along with the students, so I was in charge of the tour! I called it then and refer to it to this day as the "blind leading the blind" tour, as I had not a clue as to what I was doing, or to do. 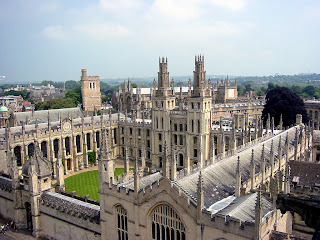 The next trip was much more pleasant for me, as I was on my own, had plenty of time to explore, and even though my B&B was overly expensive for the the unpleasantly cramped room and not very good breakfast, I grew somewhat enamored of Oxford. 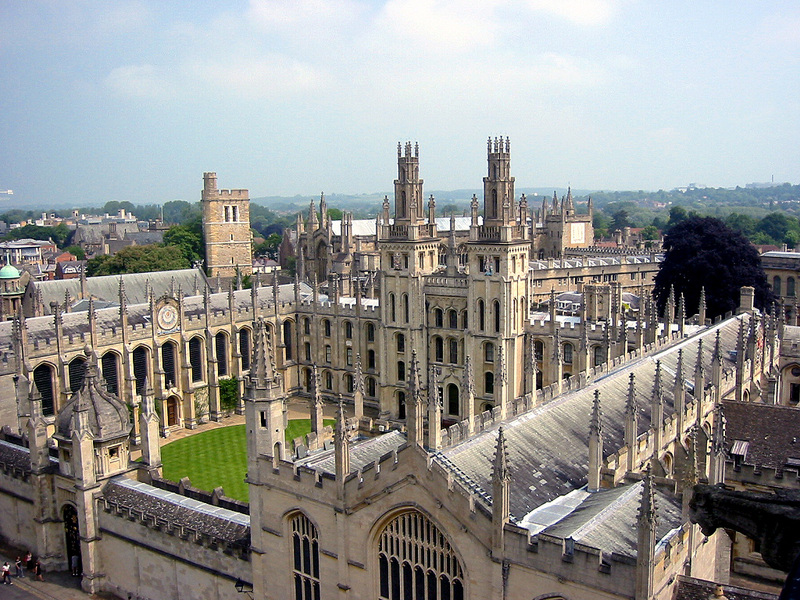 I climbed to the top of University Church of Mary the Virgin and was treated to panoramic views of the colleges, the Radcliffe Camera, views of the countryside, I walked the lovely grounds of Magdeline College, I visited Christchurch College, had leisurely pub meals watching punters on the river. It was a very nice visit. I'm afraid that last Saturday's dash through Oxford was disappointing, largely because of the crowds and my exhaustion, and I ended whiling away a good bit of the allotted time there having cream tea with Claire Mokrauer-Madden in the Ashmolean museum. I prefer to remember my idyllic visit in early summer 2011. That ended the Stratford trip, save for a fairly easy coach ride back to London. While the very end was somewhat less than desired, I had a lovely time, as did many of the students. Meanwhile, Bill Sheasgreen's work never ends, for the next morning he took a group of eight students and me on a Beatles walk, mostly through Soho, ending with the famous street crossing depicted on the Abbey Road album. Great fun! I won't blog about that, but do have a look at my facebook photos of the event. My next post will probably not come for a few weeks, as I've given up on traveling this coming weekend, and will save energy and money for my fall break trip. Ciao tutti!